Analyzing NFL Ticket Prices: How Much Would You Pay to See the Green Bay Packers? Which team is the least/most expensive to watch at home? Which team is the least/most expensive to watch on the road? 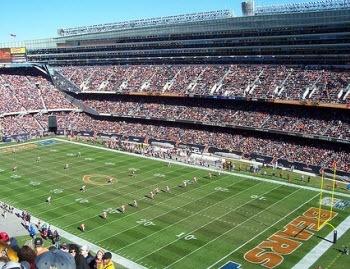 If you are thinking of a road trip, which stadiums offer the largest ticket discount for your team? For dedicated fans, this is far from a trivial matter. As we'll see, fans of one team can get an average 48% discount on road-game tickets, while fans of two other teams will pay, on average, more than double the cost to see their team on the road. 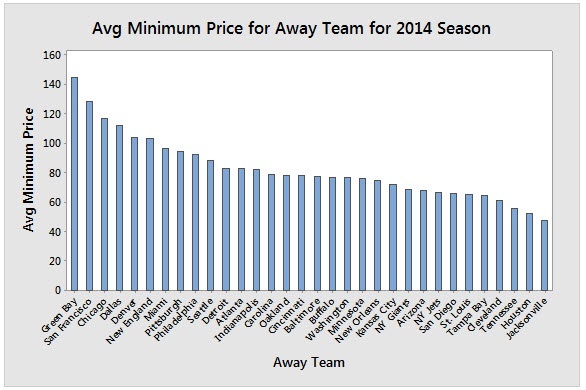 Which Is the Most Expensive Team to See on the Road? The Bar Chart below shows that Green Bay is the most expensive road team to watch play with a 2014 average price of $145 per road game. This is noticeably higher than the other NFL teams. The next closest is San Francisco with an average price of $128 per road game. But catching a Jacksonville road game is a fraction of those costs, averaging $48. Which Is the Most Expensive Team to See at Home? The Bar Chart below shows that Chicago is the most expensive team to watch play on their home turf, with a 2014 average price of $175 per home game. 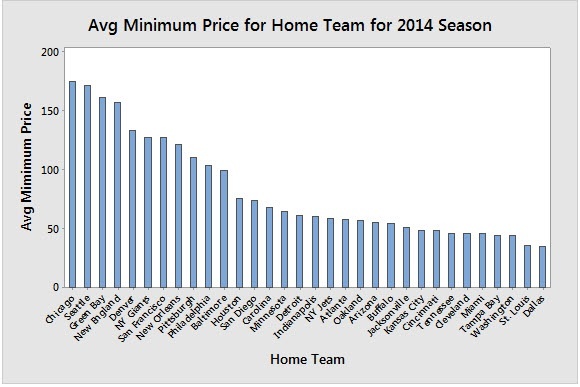 Seattle is a close second with an average price of $171 per home game. 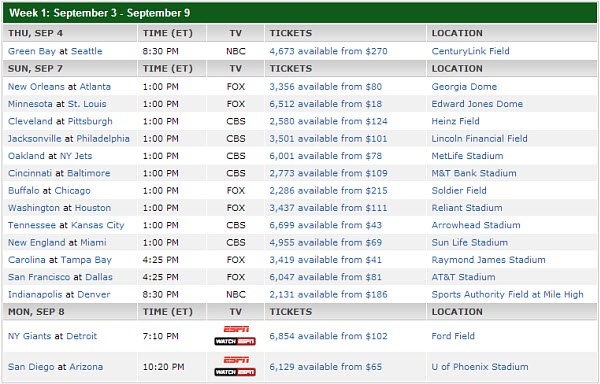 Seeing Dallas or St. Louis in a home game is a fraction of those costs, averaging just $35. 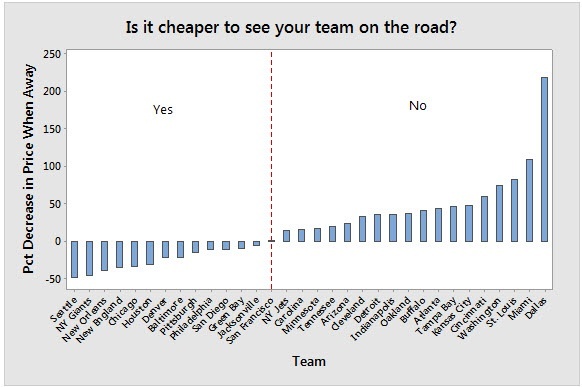 Is It Cheaper to See Your Favorite Team on the Road? Finally, I compared the average home game ticket price to the average road game ticket price for each NFL team. The road team discount award goes to the Seattle Seahawks. You'll save, on average, 48% watching their games on the road. But if you're a fan of Dallas or Miami, you'll be financially better off watching your team at home—their average price increases more than 110% when they're on the road. One factor that drives this result is the popularity of Dallas and Miami across the country: the higher demand supports their higher road-game price. Also, Dallas' enormous home stadium (AT&T) offers cheap Party Pass seats (which aren't really seats at all, but rather a standing room section). One drawback with this analysis is it doesn't take into account the opponent that each team faces. For example, Chicago may happen to be playing some very popular teams at home in 2014, which drives their home-game ticket prices up for this season. In a future post, I'll discuss how to adjust for opponents and other variables such as game day and game time.